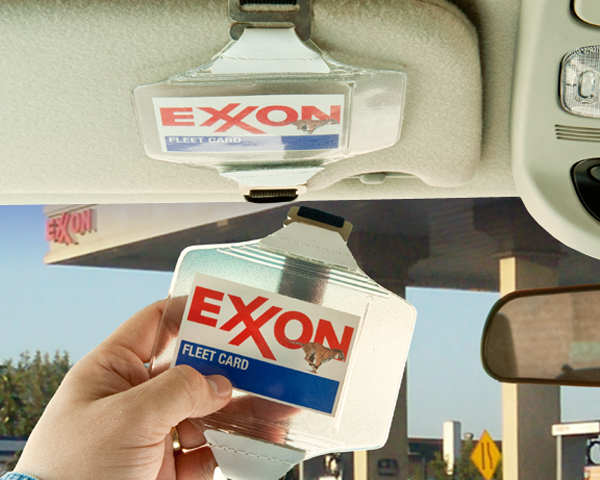 Check out our heavy-duty plastic fleet fuel gas card holder. Made from clear durable flexible plastic, it is a great gas card / gift card / debit card holder for all types of fleet operators or anyone who wants to leave their card stored neatly in their vehicle. The fleet fuel card holder VisorWallet straps securely to the visor and keeps the card with the vehicle so it never gets lost and is never out of reach. The heavy-duty wide elastic strap is sized to fit almost any vehicle's visor. A visor organizer to hold your fleet gas card or fuel card and all related receipts is convenience and secure. With the clear vinyl fuel card holder keep a photo ID, insurance card, fuel card, business cards and receipts / small papers handy and secure. Its size is large enough to accommodate 3 - 4 credit card sized CR80 plastic cards or a gas card along with all gas receipts for good record keeping.